All transactions are safe and secure with a reliable history in online purchasing behind each of our associates. 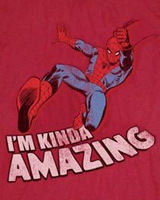 Buy the I'm Kinda Amazing Spider-Man t-shirt to own Spider-Man clothing and merchandise. The eye-catching look of this bestselling Amazing Spider-Man tee shirt is a great way to express your fandom for the retro side of the web-slinging superhero. Whether you're a fan of the early Spider-Man comic books, or Spidey apparel in general, this tee is the perfect way to satisfy your appetite for each. Wear it underneath a comfy Spider-Man sweatshirt. In addition to the I'm Kinda Amazing Spider-Man tee above, browse the Spider-Man Clothing Gallery for more apparel like men's and women's clothes, kids shirts or hoodies.